The cape was discovered by the British National Antarctic Expedition, 1901–04, under Robert Falcon Scott, who named it the "Skuary" after the birds. Scott's second expedition, the British Antarctic Expedition, 1910–13, built its headquarters here, renaming the cape for Lieutenant Edward Evans, Royal Navy, second in command of the expedition. Scott's headquarters building still exists and is known as Scott's Hut. Scott's Hut has been designated a Historic Site or Monument (HSM 16), following a proposal by New Zealand and the United Kingdom to the Antarctic Treaty Consultative Meeting. A cross on Wind Vane Hill, Cape Evans, was erected by the Ross Sea Party, led by Captain Aeneas Mackintosh, of Sir Ernest Shackleton's Imperial Trans-Antarctic Expedition of 1914–1917, in memory of three members of the party who died in the vicinity in 1916. The cross has been designated a Historic Site or Monument (HSM 17), following a proposal by New Zealand and the United Kingdom to the Antarctic Treaty Consultative Meeting. 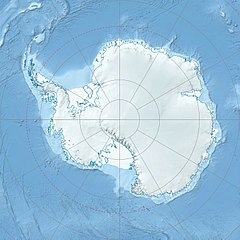 The whole site is protected as Antarctic Specially Protected Area (ASPA) No.155 largely because of its historic significance as one of the principal sites of early human activity in Antarctica. ^ "Evans, Cape". Geographic Names Information System. United States Geological Survey. Retrieved 2012-03-09. ^ a b Langner, Rainer-K. (trans. Beech, Timothy) (2007). Scott and Amundsen: Duel in the Ice, p. 120. London: Haus Publishing. ISBN 1-905791-08-9. ^ "Cape Evans, Ross Island" (PDF). Management Plan for Antarctic Specially Protected Area No. 155: Measure 12, Annex. Antarctic Treaty Secretariat. 2008. Retrieved 2013-06-12. This article incorporates public domain material from the United States Geological Survey document "Evans, Cape" (content from the Geographic Names Information System). This Ross Island location article is a stub. You can help Wikipedia by expanding it. This page was last edited on 26 August 2018, at 16:00 (UTC).